Vultures. People who lent Puerto Rico money and now expect to be paid are being portrayed as greedy vultures. But Puerto Rico's $70 billion debt crisis isn't just a battle between New York hedge funds and a cash-strapped little island. 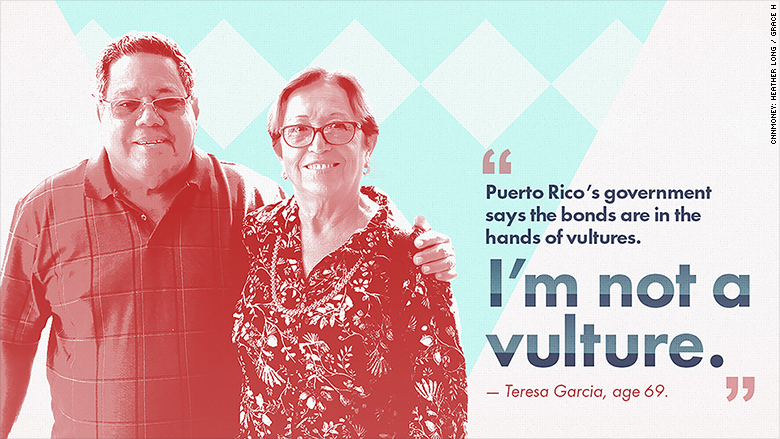 About 30% of the debt is held by middle class Puerto Ricans like Teresa and Julio Garcia. Another 15% is held by other "average Joe" Americans who invested in bond funds. "The government says the bonds are in the hands of vultures. That's not true," says Teresa, a life-long Puerto Rican. "I'm not a vulture." The Garcias are retirees. They gush about their grandchildren. And they love Puerto Rico. Teresa was born in the city of Ponce -- "the most beautiful place," she claims. When the Garcias used their life savings to buy about $500,000 worth of Puerto Rican bonds in 2005, they thought it was a safe -- and patriotic -- investment. The bonds were AAA rated and backed by the government. What seemed like a win-win is now a nightmare for the Garcias. They've lost over $200,000. Many Puerto Ricans face a triple whammy of pain: their bonds are worth a lot less, their taxes are going up and their home values are plunging because of a mass population exodus from the island. In a special investigation, CNNMoney met with numerous Puerto Rican bondholders. Their stories put a face on the crisis. The government's latest proposal to pay bondholders roughly half what they are owed would hurt hedge funds, but also regular people. Joaquin Garcia de la Noceda is 57. He's not sure he'll ever be able to retire because of the Puerto Rican bond crisis. In 2001, he invested about $200,000 in the bonds. He says his initial investment has fallen 60%. De la Noceda is a locksmith, not an investment expert. His financial advisor recommended buying the bonds. Now the advisor claims, "This is something that no one anticipated." "People say the rich will pay Puerto Rico's debt, but I am not rich" says de la Noceda, who just finished paying for his daughter to attend university and is assisting his 96-year-old mother. He and his wife run a locksmith businesses. The island's crisis is hurting that too. Companies are closing because of a prolonged recession, and the government is delaying payments that it owes businesses. De la Noceda used to get paid within about a month of doing a job. Now it typically takes 60 to 90 days, even if he is doing work for a private company. People of all ages bought the bonds. One was tech entrepreneur Carlos Melendez. "I will never buy Puerto Rican bonds again," he told CNNMoney. He views his investment as "basically a write off." At age 40, he's lucky he didn't invest too much in the bonds and has time to save more. Melendez is exactly the type of person Puerto Rico needs right now. He grew up on the island and has a law degree. Fluent in English and Spanish, he became a tech expert and worked in Minnesota for a big U.S. firm for awhile but moved back to the island. In 2003, he co-founded the software company Wovenware, which now has 32 employees. Wovenware's offices are in San Juan's Santurce neighborhood -- the island's equivalent of Brooklyn. It's a hip area that's one of the few places visibly growing and improving. "We decided to stay and make it work. Someone has to stay," says Melendez. Carlos Alberto Ponce de Leon will turn 68 in March. He's still working -- running a small business now -- because his retirement fund has lost 60% of its value. An engineer, de Leon worked for many years at the island's power electric utility (known as PREPA). He'll never forget going to a seminar at PREPA for people who were about to retire. He claims the folks who ran the seminar advised workers to invest in Puerto Rican bonds. They would be "secure" and "conservative." They came with a good interest rate and special tax exemptions. Plus the workers would be "doing this for Puerto Rico," much like people who U.S. bonds during World War II. He invested several hundred thousand dollars in 2001 and added more in the following years. "I cannot recover 40 years of work. This represents the savings of my life," he told CNNMoney. Today de Leon hardly ever goes out to eat. He drives a 1986 car and his work van is from 1996. Maria Milagros Rodriguez worked all her life to build a very successful furniture business in Puerto Rico. Around age 55, she went to UBS, one of the big banks on the island. Her financial advisor there told her to put some money into Puerto Rican bonds and some in a fixed income fund. It turns out that fund was also heavily invested in Puerto Rican bonds. "I cry every day," she told CNNMoney. She has lost over $1 million. Rodriguez estimates that she has about 36% of her initial investment left. That's how much a firm recently offered her to buy her stake. "We have worked hard and honestly. They have robbed us of what we have," says Maria. She and her husband Gabriel are focused on their children and grandchildren. Her daughter has health issues, so she is trying to support her and the little ones. "I don't spend. I give it all to my grandchildren," says Rodriguez. The Garcias have been married for almost half a century. They finish each other sentences. Both worked all their lives, Teresa as a chemist for Pfizer and Monsanto and Julio as an accountant for the government. "All of our savings were invested with UBS in Puerto Rican bonds. We were expecting that with Social Security and our bond earnings, we would have enough money to be OK and secure," says Julio Garcia, age 77. The value of their bonds has dropped in half. Fortunately, they did have other investments, but the majority of their retirement savings was in Puerto Rican debt. Today they receive about $1,000 less than what they expected each month. It means they don't go out to movies or dinner much. They save to see their grandchildren in Arizona. Their children moved there because there weren't any jobs on the island for them. "I have been many places -- Europe, Canada, the U.S., other islands. Still, I find Puerto Rico so beautiful. It's so sad to see Puerto Rico go down hill like this," says Teresa, who will soon turn 70.